​Have your employers match it! Over 65% of Fortune 500 companies offer employee matching gift programs. 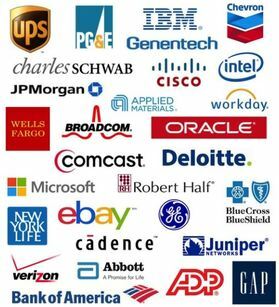 Do you work for one of these companies? Do you work for one of these local companies? The companies listed here have matching gift programs through which they make donations equal to the contributions of their employees. Sometimes they match contributions of spouses and retirees as well. If your company is listed here, please consider filling out a matching funds form at work today. Forms are available through corporate Human Resources or Personnel offices, and often available online. BP North American Petroleum, Inc. Contractors Bonding and Insurance Co. Please submit your matching gift request online through your internal website Total Access or call 1-866-473-2016. If you volunteered time for a Woodridge Elementary PTSA event, you can also request funds. For every 25 hours of volunteer service you give to an approved organization, Boeing will donate $250 to the organization. (Volunteer match is currently not available for retirees or non-U.S. employees). Please submit your matching gift request online through your corporate intranet or call 866-243-6855. If you volunteered time for a Woodridge Elementary PTSA event, you can also request funds via the Dollars for Doers program. Please submit your matching gift request online through your corporate intranet. If you have any questions you can email MS@Easymatch.com or call 800-480-4438. If you volunteered time for a Woodridge Elementary PTSA event you can also request funds by clicking on the "Volunteer Manager" button on Microsoft's corporate intranet. When you donate 10 volunteer hours, you can submit a volunteer matching gift request for what is eligible under the Microsoft Matching Program Guidelines. Please submit your matching gift request online by accessing mywfgiving.com or calling customer service at 1-888-518-4438. For more information, please contact your company. Wells Fargo does not match volunteer time at this time.